Moving can take a major toll, particularly when you’re moving long-distance. Costs and stress levels can rise exponentially during this process, all as you’re trying to adjust to life in a new city or region. But there are ways to minimize this stress. These methods center around the principle that moving is both an investment and a commitment. If you take on moving tasks in a committed, responsible manner, you’ll feel more energized throughout the process. Here’s a 7 step plan follow in order to reduce long-distance moving stress. Planning and organizing your move weeks in advance can help reduce your stress level considerably. Moving is a major undertaking that includes several comprehensive tasks — such as packing, loading, unloading, unpacking and cleaning. The earlier you begin planning for all these steps, the less overwhelmed you’ll be when moving day arrives. Diane Schmidt with about.com recommends planning a move anywhere from 8 to 12 weeks in advance of moving day. This way, you can gradually take on all the tasks you will need to move. There will likely be more to do than you imagine there will initially; these tasks could take longer than you might think they will when you first make the decision to move, so budgeting this much time is crucial. Next, set up a to-do list and schedule tasks. A spreadsheet is great for this, since you can set up a time frame for everything you need to do. Whether you’re a taskmaster or a procrastinator, splitting up all your agenda items into weekly assignments will be easier and less stressful than taking care of everything on the eve of a move. Consider donating items you no longer need. This should be the first task on that list you just set up. You’ve probably accumulated a lot of stuff in your current home that you either don’t use or have any real need for in your new home. Go through all your possessions and look for things to get rid of. Don’t be trapped by indecision, emotions or perceived value. As you look at each item you own, assume you’re going to throw it out. Then, make a convincing argument why you should keep it instead. Ask yourself hard questions about everything. If you can’t make a compelling case to keep an item, get it off your hands by selling it, donating it or throwing it out. There’s also a common misconception that it’s better to lug something that you haven’t used in years (or at all) to your new home instead of just buying a replacement later. This plan might seen cost-efficient, but moving things you don’t need to your new home makes your move that much bigger and more stressful. Ultimately, you end up paying the price emotionally by carrying dead weight with you. As you prepare to pack, make sure you take inventory of everything you have. 3. Make an inventory list. As you clean out closets and rooms, take the opportunity to make a comprehensive list of everything you have. This is important not only for insurance purposes, but also to assess what you might need to buy for your new home. Take special note of what condition all your items are in. Regardless of how your items get moved from your current home to your new one, things could happen to your possessions en route. If you have a clear, written idea of what condition your items were in before the move, you won’t have to guess whether your items were damaged by the move or not. Label and organize your boxes by which room they’ll be unpacked in at your new home. 4. Pack in an organized fashion. 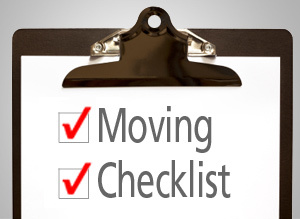 My Move performed a survey of the most stressful moving tasks, and packing topped the list. This is a crucial component of the moving process, so there’s no way to avoid it. But there are ways to minimize any headaches associated with both this process and the unpacking process. Label boxes with the room they’ll be unpacked in at the new home, along with the contents of the boxes. Also, try and keep all boxes that go in a particular room together so they will be both moved and unpacked together. Think efficiency in terms of boxes. Well packed, medium sized boxes are easier to move than a jumbled mess in a large box. Don’t move your items like this. 5. Make sure items are moved efficiently. The road can be an unpredictable place. Whether you’re having items shipped, transported by movers or moved by yourself, make sure that all boxes and furniture are stacked or placed close together. Also make sure items are restrained with straps or ropes. Moving vehicles will likely face multiple changes in traffic conditions and speeds on a long distance move. It’s particularly important to make sure items are loaded onto moving vehicles efficiently for these moves, in order to minimize the chance that any of your possessions get damaged en route. Make sure this doesn’t happen to your possessions en route. 6. Keep tabs on your items en route. When you’re moving long-distance, your items will likely be in a moving vehicle for hours or days. 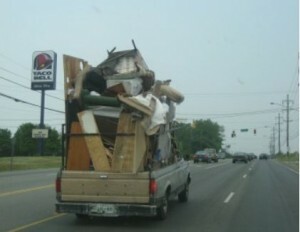 If a moving company is operating this vehicle, make sure they can be trusted with your possessions on the road. Also, keep tabs on where the moving vehicle is every few hours, if possible. If you’re operating a moving vehicle, make sure the vehicle is locked and secured whenever you step away from it, as well as whenever you stop for the night. Unpack the items in your new home gradually to reduce stress. 7. Don’t rush the unpacking process. Once you’ve reached your new home, there’s almost inevitably going to be an urge to unpack everything and get settled in quickly. The sight of boxes isn’t very appealing, and it’s tough to function in your new home with everything packed away. Avoid this temptation! You’ve just moved to a new city, state or region, and you need to account for the acclimation to your new environment. Unpack items gradually, starting with the most essential (such as your bed). This way you can ease yourself away from the stress of your just-completed move while getting adjusted to your new home and neighborhood. Getting ready to move? Then look no further than Garrett’s Moving and Storage. We’ve moved thousands of customers across both the Dallas-Fort Worth Metroplex and across the United States since 1992. For a free moving quote, click here or call 972-487-5843. 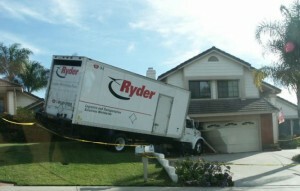 This entry was posted in Stress Free Moving Tips and tagged long distance moving, moving stress, Moving Tips. Bookmark the permalink.